A wide strip of clean white sand is all that separates this resort from the sparkling waters of the Caribbean. Rooms are comfortable and spacious, embodying the warmth of the island. Guests can choose from a variety of unique dining options, pools and water sports. or simply enjoy the tropical breeze while sipping a cold drink on the beach. 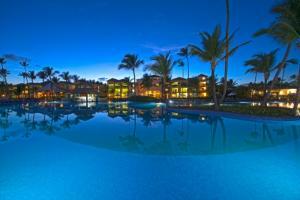 Located beachfront, approximately 12 miles from the Punta Cana airport.